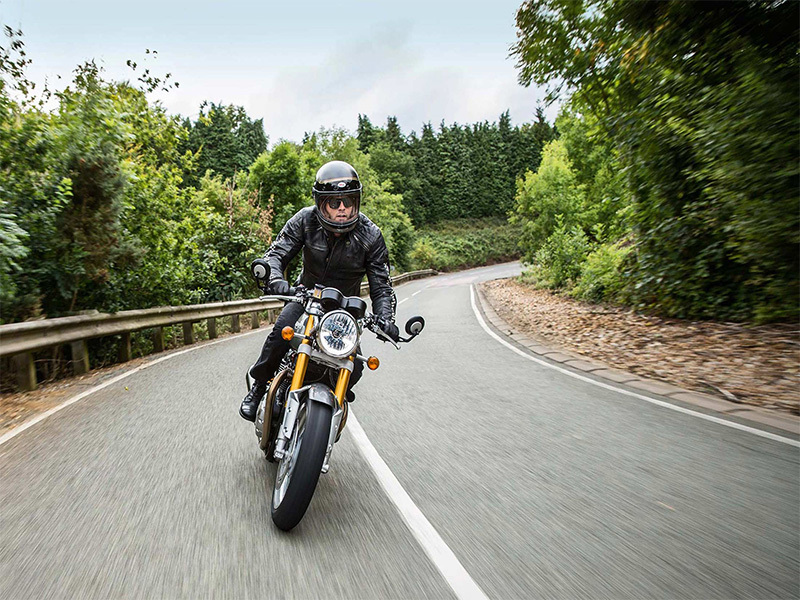 The incredible 1,200 cc ‘high-power’ performance and rider-focused technical capability of the Thruxton, the ‘R’ is equipped to the highest specification with a fully-engaged rider position kicked-up back end, smaller diameter grips and a higher specification of equipment all around. Thruxton R’s perfect balance of breath taking style, thrilling performance, handling and category-leading capability heralds the return of the Triumph racing legend. THRILLING NEW 1200cc ENGINE: The legendary character of the Thruxton comes to life through the all new 1200cc, high power, 8 valve, parallel twin engine. The all-new 'low inertia - high performance' six-speed engine features a lighter crank and airbox unique to the Thruxton and Thruxton R. With the pin-point accuracy and instant throttle response of Triumph’s next generation ride-by-wire fuel-injection, fed by authentic twin throttle bodies, the Thruxton spec engine delivers a massive peak torque figure of 112FT-lbs at a low 4950 rpm - an amazing 62% more than the previous generation. With a high power output of 97HP at 6,750rpm, 41% up on the previous model’s engine, the new 1200cc Thruxton delivers much more power lower down and across the whole rev range, with an incredible 68% more power at 4,500rpm. BEAUTIFUL STYLE AND SOUND: Beautifully styled with a very high level of finish and detailing the new Thruxton 1200cc high power engine incorporates visual cues from the Thruxton Bonneville whilst integrating contemporary engine components to maintain that authentic look. With all new upswept reverse megaphone exhausts designed to deliver the thrilling sound of a British racing twin, with a rich and raw note that matches its legendary name. SIGNIFICANTLY ENHANCED FUEL ECONOMY: Behind the new 1200cc Thruxton spec engines exterior is an advanced liquid cooling system sensitively designed to minimise its visual impact whilst achieving cleaner emissions and enhancing fuel efficiency – 11% better than the previous generation. Combined with a new extended service interval of 10,000 miles, (16,000km), this contributes to a reduced overall cost of ownership. 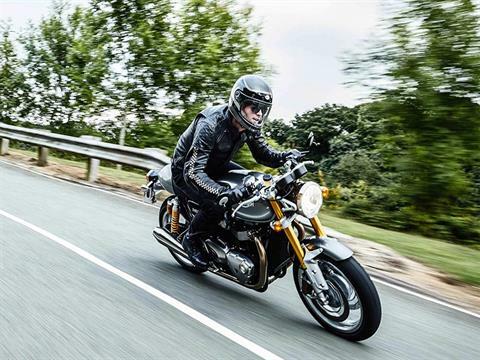 BEAUTIFULLY AGGRESSIVE STYLING: With all of the brooding presence and poise of the original Triumph racers the all new Thruxton and Thruxton R take the modern classic sports bike to a new level. Combining beautifully sharp and imposing styling with a wealth of high quality details, including a slim sculpted petrol tank, single seat set-up and a unique flip-up ‘Monza’ cap, the Thruxton and Thruxton R set the new benchmark. BEAUTIFUL DETAILING: Both feature a unique fuel tank incorporating a flip up ‘Monza’ cap (a first on any modern production bike), bullet seat and lightweight aluminum bar end mirrors, wheel rims and swinging arm. 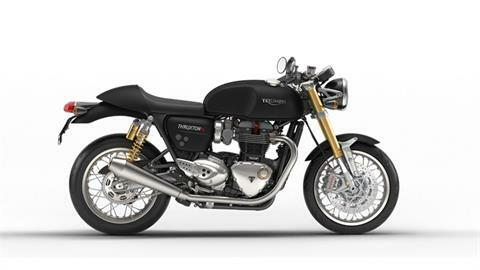 The Thruxton R features an additional painted seat cowl, polished top yoke, tank strap and clear anodized aluminum swinging arm. 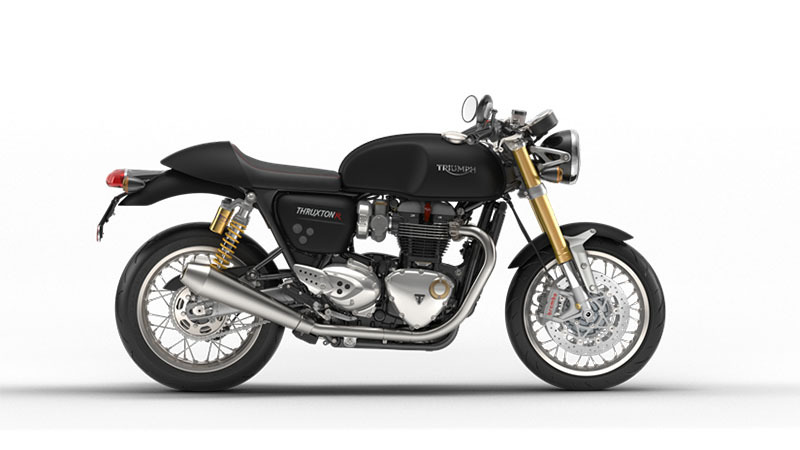 There are three Thruxton colour choices, Jet Black, Pure White or Competition Green, and three for the Thruxton R in Diablo Red, Silver Frost and Matt Black. 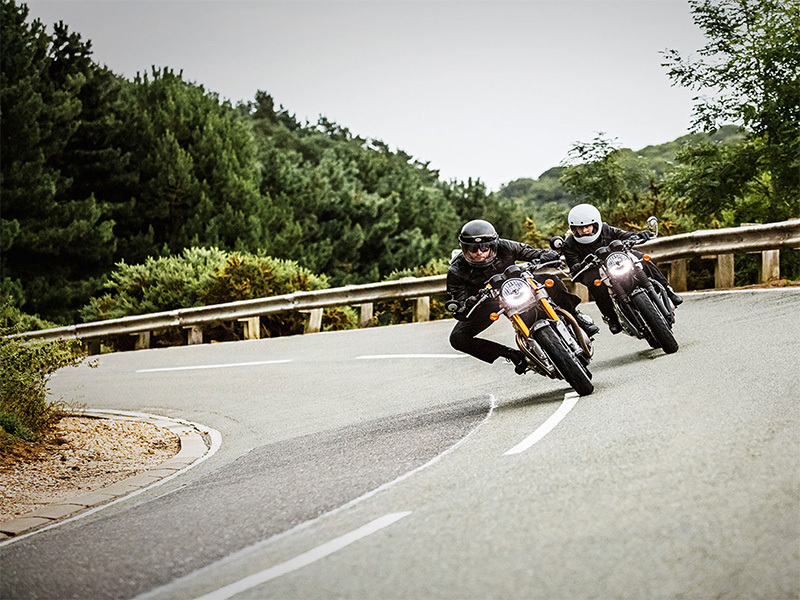 ABS: The contemporary safety standard, Triumph's anti-lock braking system brings a new level of control to the Thruxton and Thruxton R.
RIDE-BY-WIRE: The Thruxtons' electronic ride-by-wire system enhances throttle control, responsiveness, safety and feel. RIDING MODES: Linked to the ride-by-wire system the three selectable Mode options 'road, rain and sport' provide the rider with greater control and safety and with the 'sport' mode an even more immediate response. 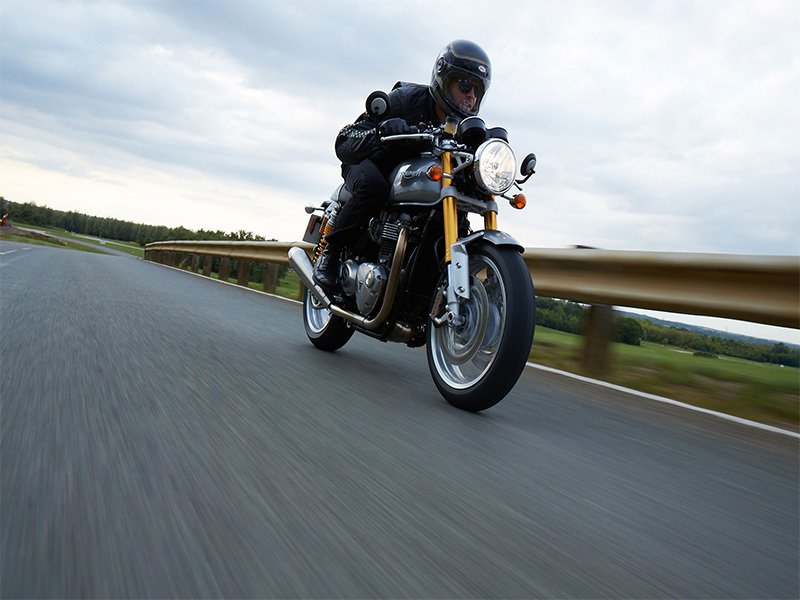 TRACTION CONTROL: Taking advantage of the sophisticated ride-by-wire system the Thruxton and Thruxton R incorporates a switchable traction control system that optimises the delivery of its outstanding torque. TORQUE ASSIST CLUTCH: Bringing a light touch and feel to the clutch control of the Thruxton and Thruxton R, the new torque assist clutch system makes it easy to ride, and ride longer. FINGER TIP CONTROLS: The new Thruxton and Thruxton R switchgear presents a simple fingertip control scroll button for easy access to the key features on the new digital clocks. USB CHARGING SOCKET: An under-seat USB socket is provided so you can charge up your essential devices. TWIN FEATURE CLOCKS: Stylish feature-packed twin clock (speedo and rev counter) with beautiful 3D dial faces cleverly incorporating a digital menu system accessed by a handlebar mounted scroll button. Key features include: gear position indicator, odometer, two trip settings, service indicator, range to empty, fuel level, average and current MPG, clock, access to turn off traction control and ABS features. DRL HEADLIGHT: A new contemporary standard, the Thruxton and Thruxton R headlight incorporate the latest daytime running lights (DRL) delivering a distinctive signature light pattern. LED REAR LIGHT: New LED real light, incorporated into the classically inspired and stylish tail set-up, bring a distinctive rear light pattern and power efficiency. ENGINE IMMOBILISER: A security device that integrates a transponder into the new Thruxton key, linked to a receiver in the ignition system, that prevents the engine from running if the correct key isn't used.